LOL!! “Oh. That kind of idiot.” That was great, Fae!! Hee hee, Sano can do Saitou’s job for him. Hee hee. Hee hee, fuzzing out of kanji so that you don’t have to be specific about all of them. it’s alive! it’s alive! ^__^ sorry, crazy moment there. yes, you were right, it does look cool in color too. and weekly updates?! and and… ok, i’ll stop jabbering now. What a good idea, and well executed. I love Saitou’s thoughts on Sano’s on Saitou ^_^;. I’m quite envious of the way you can write funny and interesting dialogue. Saitou’s eyes in the second panel are the most awesome ever. GLARE. 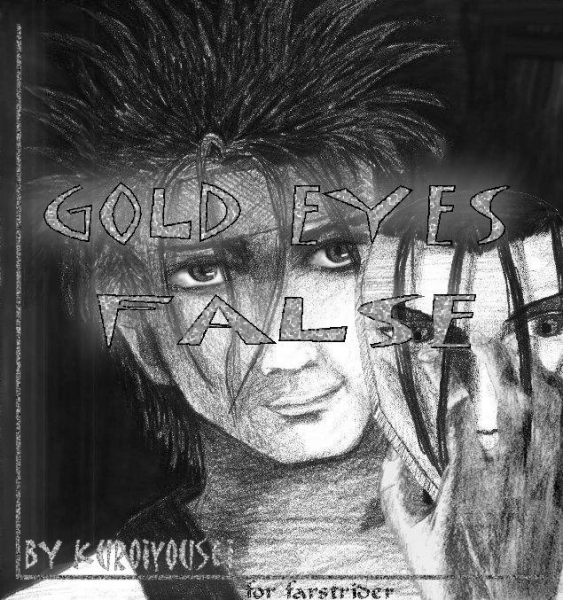 TYvm faery for ‘gold eyes false’ … been waiting for this one a long time inbetween. Looking forward to the next. BTW I’m also enjoying “Aku,Soku,Zan(za)! da ha ha! silly boy. Da ha ha… the blush is priceless! Why do I get the feeling that this won’t turn out well? Oh. . . mayhap because you’re writing it? ^____^. . . .
oh, the hands in the last panel(s)… nice. Love this page (and love the whole story)! The smoking thing is a good idea. I finally catched up. I like!!! Hahaha, most definitely! What a great present ;D Happy Holidays! Sanosuke screaming Saitou’s name is a great Christmas present!!! Yes I can believe that you posted on Christmas Eve and New Year’s Eve because you are awesome like that. . . .If you are still stuck, how did you get the present? I’m really glad that you will find it useful! Tomato juice all over the floor! We need — MR CLEAN. Haha, I love the dialogue and how concerned Sano is ;D Can’t wait for next week! xD That’s great. Revenge is sweet. We should hold a funeral for Saitou’s burned antennae, LOL. Yeah ^^ Another installment! And right before work. Yayness. “Though I kinda deserved that one.” — Hey, man, at least he admits it.